When I first saw the headline “How to head off kids’ summer weight gain” on USA Today, I couldn’t understand what they meant. What kind of children would gain weight during the summer months? When I think of childhood summers, I think of being outside, playing with friends until dusk, riding bikes, swimming, climbing trees, eating light (homemade) meals because we were too busy enjoying the British sunshine drizzle. Sadly, however, for many children in the United States today, summer means something very different. For many modern youngsters, summer is when they spend more time sitting around watching TV, playing video games, and interacting with others on social media. In fact, two-thirds of children between the ages of 5 and 12 spend at least three hours a day using some form of media, according to a survey conducted by the American Academy of Pediatrics (AAP) and the YMCA. And not only are these children not going outside to play with friends, they are not even walking to the school bus stop, walking between classes at school, or being active during gym classes or recess. Research has repeatedly shown that childhood media use is a significant contributor to obesity. Studies have found that an increase in television-watching at the age of three corresponds to an increased risk of being overweight by the age of six or seven. Research even shows that simply having a TV in a child’s bedroom is a significant obesity risk factor. As a result of this body of research, the AAP recommends that children be allowed no more than 2 hours of non-educational screen time per day. Another factor that contributes to summer weight gain in children and adolescents is the quality of the food they eat. As bad as school lunches may be, many families struggle to pay for food in the summer months when school breakfasts and lunches are no longer being provided. As a result, the focus is on filling bellies rather than providing nutritionally-fulfilling meals. This means more calories, less nutrients. Irregular summer sleep patterns may also add to the risk of children gaining weight. Insufficient sleep and poor quality sleep have both been associated with an increased risk of obesity in young people. Maintain a regular sleeping, eating, and activity routine over the summer. Make use of the longer evenings to cook together and take a walk afterwards. Find free or low-cost programs for children who might be at a loose end, for example, the Y or your local parks department. Cut out soda and replace it with water or low fat milk. Occasional fruit juice can also be offered, but make sure it is 100% fruit juice. Make sure your children eat breakfast every day. The risk of obesity significantly increases for those children that do not eat breakfast. Make sure their portion sizes are appropriate. Have plenty of healthy snacks accessible and visible. Cut fruit, vegetable bowls, and dates with almond butter are some good snack ideas. Keep all food in the kitchen. A recent study found a correlation between obesity and keeping food in rooms other than the kitchen. That means no packets of pop tarts hanging around in the kids’ bedrooms! Find ways to encourage outdoor activities. 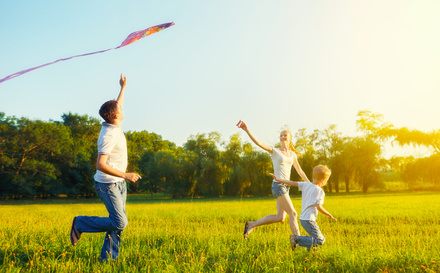 Go to the park, kick a ball, fly a kite, take walks, whatever it takes to get your children moving. For families who have a tight food budget, try to make use of cheaper forms of protein (beans, eggs), whole wheat pasta, brown rice, clip coupons, and look out for offers at the market on fresh produce. In 2012, almost one in every three children and adolescents in the United States aged 2-19 years was overweight or obese, with 12.7 million of those being obese. By following these simple tips with your own children, we can do our part to stop this epidemic.